For the Apex leader of the All Progressives Congress (APC) in Ojokoro Local Council Development Area (LCDA), Alhaji Saibu Adelaja Mohammed popularly known as Baba Ile Ogbo, the race for the Ifako-Ijaiye Federal Constituency is open to all qualified Aspirants, but seems to have been won and lost. According to Baba Ile Ogbo, the front line contender for the seat is unarguably, HON. BENJAMIN ADEYEMI OLABINJO (BAO), the Special Adviser on Civic Engagement to Governor Akinwunmi Ambode. 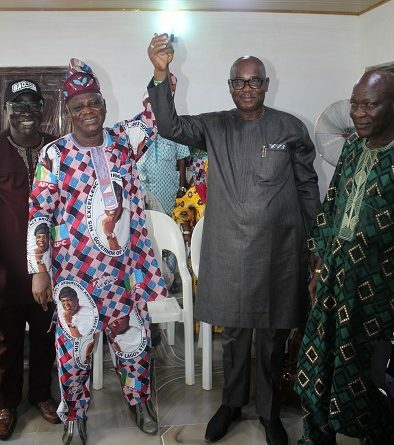 In an emphatic endorsement which has sent shivers down the spines of the other Aspirants in the race, Baba Ile Ogbo, the Life Patron of Ifelodun Group said, “BAO LEADS, OTHERS FOLLOW”. The visit by BAO, accompanied by scores of his Political Associates and supporters kick started his consultations with party leaders and members in his popular quest to represent the People of IFAKO-IJAYE at the National Assembly come 2019. The visit was emotional as it was also historic. For Benjamin Adeyemi Olabinjo, it was a golden opportunity for him to market his candidacy, outline his vision for the constituency and most importantly correct some misgivings about his personality. For most party members present at the occasion, BAO acquainted himself excellently. Speaking flawlessly amidst applauses from the audience, BAO went down the memory lane on his political trajectory by recalling his long-standing political relationship with Baba Ile Ogbo and his loyalty to the APC leader and the party. He also commended him for his steadfastness. In his response, the APC leader, who doubled as Life Patron of the Ifelodun Club, an influential caucus within the party, corroborated Olabinjo’s copious references to issues and development in the party in the past years. He prayed for BAO’s success in the Primaries and at the general election. 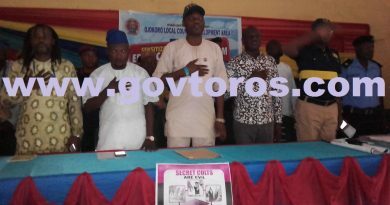 Present at the occasion were other notable leaders of the Ifelodun Club including the Ojokoro Patron, PA J.B. Onabanjo, the group’s Chairman, Hon. S.O. Abati, other Apex Leaders like Alhaji Oyayomi, Hon. P.O Taiwo and Hon. G. Eleshin. Others include Alhaja Adesina, Hon. Waheed AKindele, Alhaja B. Jimoh and Chief Eze to mention but a few. BAO’s entourage included his wife Chief(Mrs.) Omolabake Olabinjo, The Director General of BAO Stakeholders Forum, Hon. Awofolaju Ifayemisi (Eletike), Mrs Toyin Alokolaro, Hon. Fayemi, Hon. Abiola Oladejo, Hon. Idowu, Deaconess Motunrayo Tijani, Mrs. Jamiu and host of others. BAO’s next consultation visit took him to the EKO FORUM where he was enthusiastically received by the group’s leaders and members. 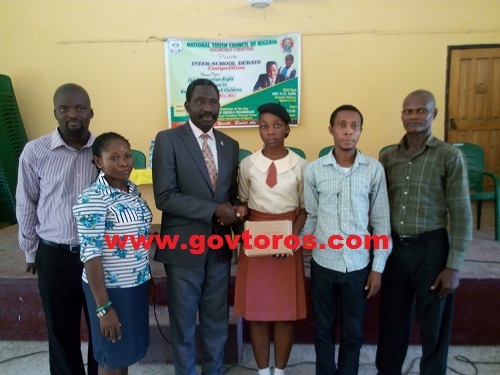 The Leader of the group, MR. TAIWO FRANCIS assured BAO of the group’s unflinching support for his aspiration. In his brief response, BAO said his visit was a mark of respect and honour for the forum. The next port of call was the base of another influential caucus, AKINWUNMI AMBODE FORUM (AAF). The introduction and welcome address for BAO and the AAF was made by Alhaji Awofolaju (Eletike), the DG BAO Stakeholders Forum and Deacon Ademiluyi respectively. 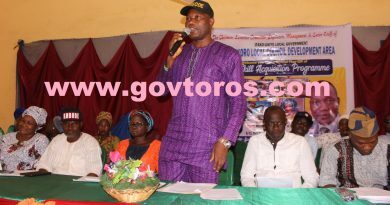 In his address, BAO reeled off his achievements during his tenure as chairman of Ojokoro LCDA and how his membership of the Lagos State Executive Council has brought dividends of democracy to Ifako Ijaiye Federal Constituency in the last three years of Governor Akinwunmi Ambode- led administration. The Apesin Ola as he is fondly called by his admires recalled how he lobbied the State Government to facilitate many road projects and a world class Specialist Hospital to Ojokoro, to be sited on Osagie Street. Olabinjo pleaded, ”If you graciously elect me as the APC flag bearer in the coming primaries, and at the general elections, I will use my contact and lobbying skills to attract more development to our constituency. I have been part and parcel of the Ifako Ijaiye communities for many years. I laid the foundation of my first house here at the age of 24 and i have lived here all my life. I have no houses in Ajah, Lekki or elsewhere in Lagos State as mischievously peddled. I know what my people need and will do my utmost to meet their needs. The first phase of consultation continued with the visitation to JUSTICE FORUM (J.F) of Ifako-Ijaiye LGA. They rolled out red carpet for BAO and members of his entourage. It was grand in all ramifications. The entire leadership of J.F (Ifako-Ijaiye) were on ground to welcome BAO. They were led by the Group’s Chairperson, Chief Mrs. Funke Olaleye, Barr. Mrs. Joana Adebobuyi, Alhaji Ayansola, Alhaji Awopeju, Baba Omotosho, Alhaji Jide Lawal, Alfa Oyinloye, Alhaji Aderibigbe, Deacon Jide Ogunbiyi, Hon. Wahab, Apostle Awolugbe, Alhaji Babarinsa, Deacon Tunde Awe and many others. Like in all the previous visits, the JF leaders asked BAO some pertinent questions, most especially his plans for the group when he is voted in. In his apt responses, BAO promised never to let the group down and to enhance the development of FKJ, in general. The last port of call for the day was to the headquarters of LAGOS FRIENDS, another sociopolitical group in Ojokoro LCDA, under the leadership of Chief Oluyomi, an apex leader in Ojokoro APC. The Chairman of the group, Alhaji Fatai Adedokun, gave a pleasant welcome to BAO and his entourage. In his address, he described BAO as a philanthropist and a trust worthy fellow, someone who is very good at lobbying. He opined that his qualities will be of great benefit to the constituents of Ifako Ijaiye. He urged party members and the entire constituents to support his bid. The BAO Media Team was on ground to cover the visitation trip. BAO LEADS, OTHERS FOLLOWS.